I love pie. I don’t make it that often because well, pie. 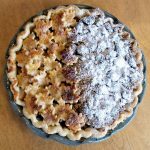 The hubby loves pie as well – in fact I think he loves it more than I do. So it is established, we both love pie. Where we run into a problem is I like crust on top of my pie and he likes crumbs on top of his pie. What to do, what to do? No, I am not going to make two pies! 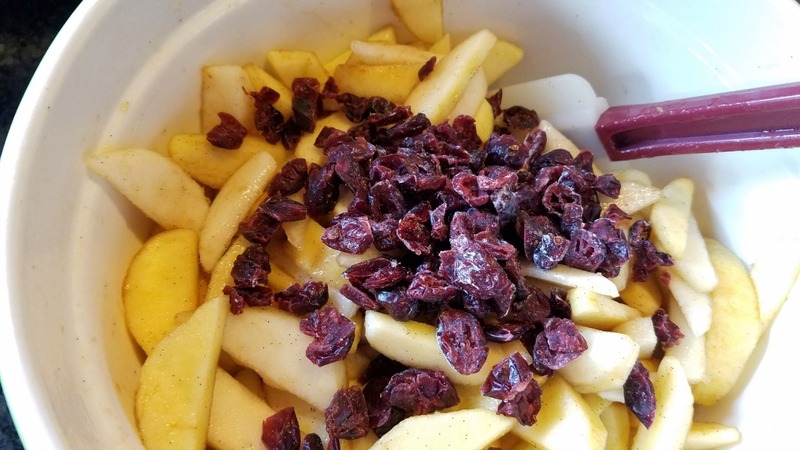 I will show you how I handled it recently in a delicious recipe for a winter fruit pie to share with your sweetheart. 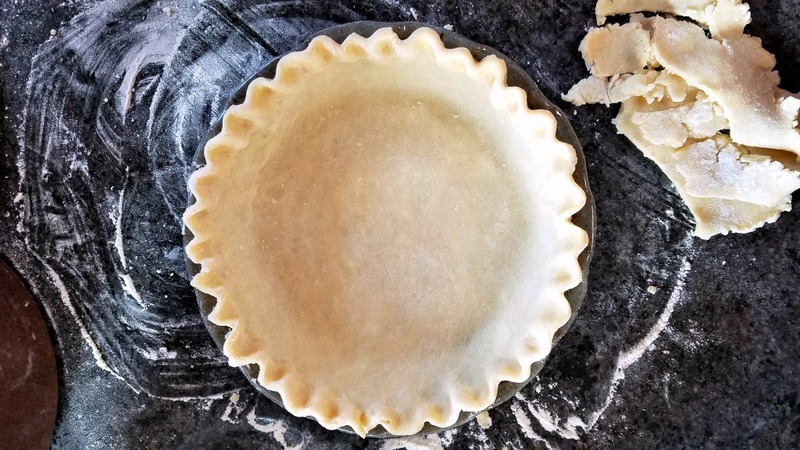 Make the pie crust – or you can use pre made. In a small bowl mix together the flour, sugar and salt. Add the apple cider vinegar and 2 TBS of ice water and mix gently with a fork. If the dough comes together continue. If it needs more water add it a little at a time until the dough does come together. Just don’t add too much. Turn the dough out onto a lightly floured surface and gently knead three or four times. Form the dough into a disc, wrap in plastic or wax paper and refrigerate for an hour. 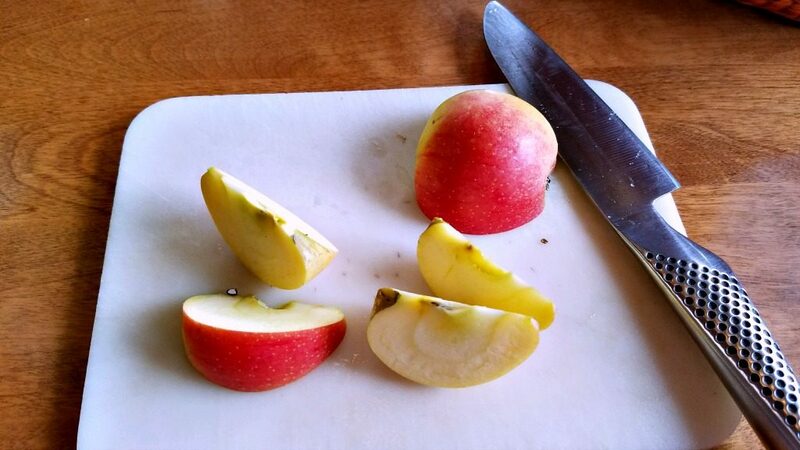 Peel and core the apples and pears and slice into wedges about 1/4″ thick. Add the fruit to a bowl and mix in the lemon juice to keep from browning too much. Occasionally stir the fruit to distribute the lemon juice. 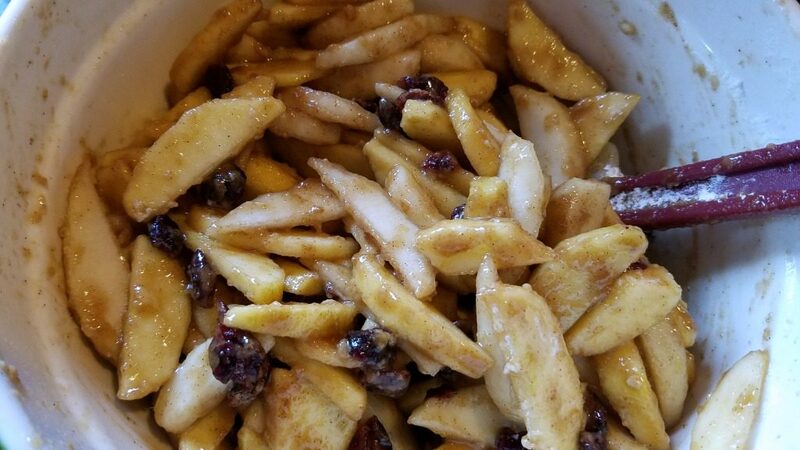 When you have finished cutting the fruit add the brown sugar, the cinnamon, cardamom, dried cranberries and salt. Mix well and set aside. Add the sugars, flour, cinnamon and salt to a small bowl. Stir in the melted butter and mix until combined. Set aside. After the dough has rested remove it from the refrigerator. Roll the dough out, carefully put it in the pie dish and trim. Make a decorative edge. Roll out the trimmings and cut out small leaves, hearts or whatever shape you would like to cover the top of half of the pie. Add the fruit to the pie crust in the pie dish. 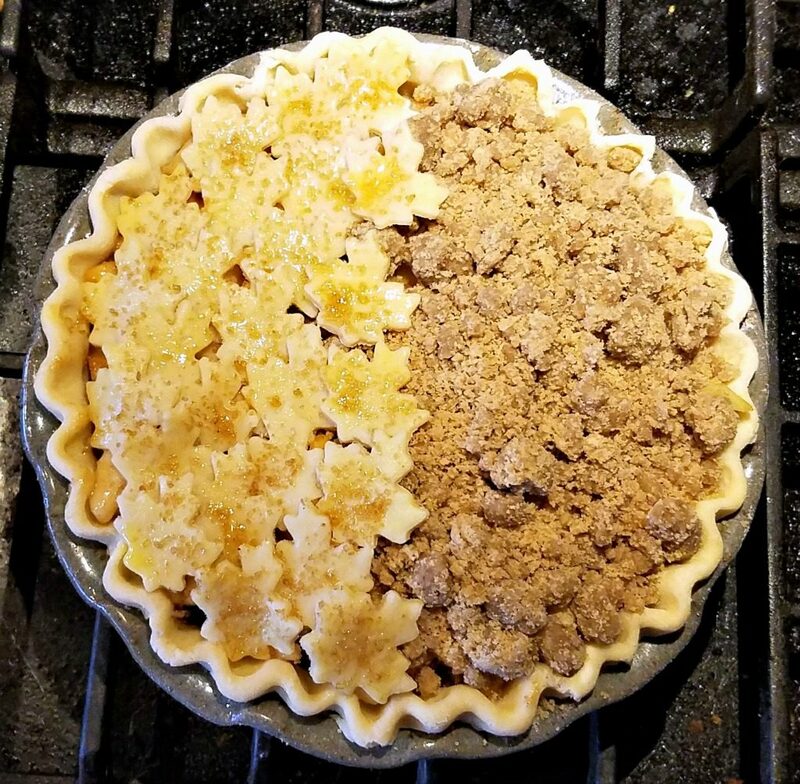 Cover half of the pie with crumbs, the other half with the decorative cut outs. Brush the pie crust cut outs with the milk and sprinkle with sugar in the raw if using. 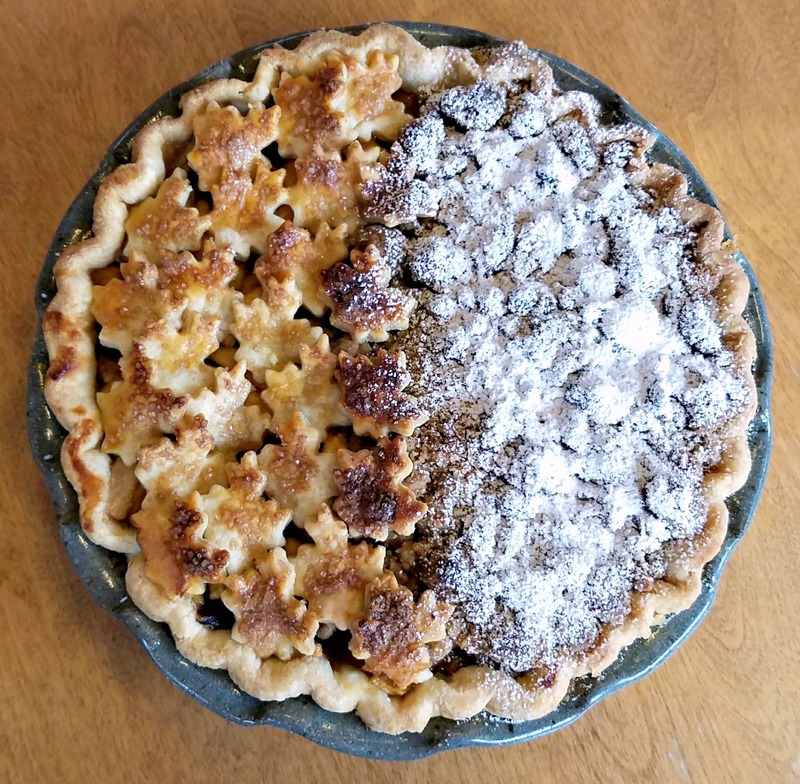 Cover the edge of the pie with foil or a silicone edge protector. Place the pie on a cookie sheet and bake in the preheated oven for 15 minutes. Lower the heat to 350° and bake for 30 minutes. Remove the edge protector and bake for another 15 minutes. Remove the pie and let cool on wire rack. Before serving dust the crumb side with confectioner’s sugar. 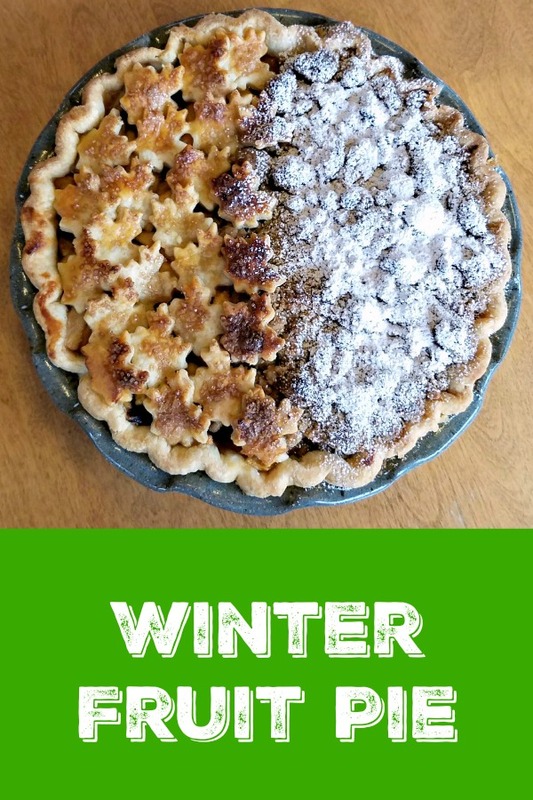 How Was the Winter Fruit Pie? This was one delicious pie. It wasn’t a sweet pie and that was just fine by me. The taste of the apples and pears really came through instead of it being all about the sugar. 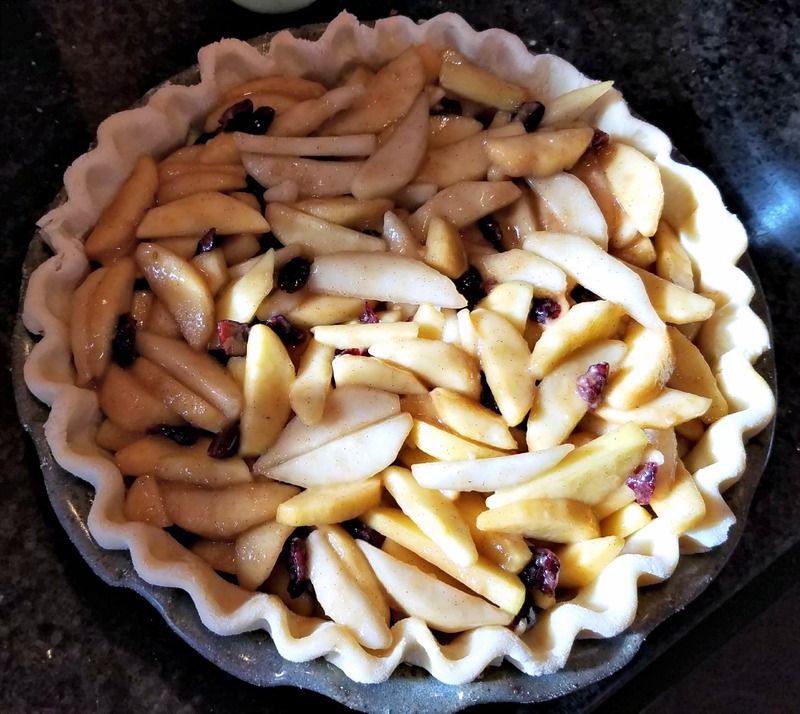 I had made this pie with apples and pears picked from my neighbor’s trees but it’s a winter fruit pie recipe I’ll use again with fruits from the store. It’s just a lovely combination of flavors and with the two different toppings you and your sweetheart can both have what you want in a dessert.